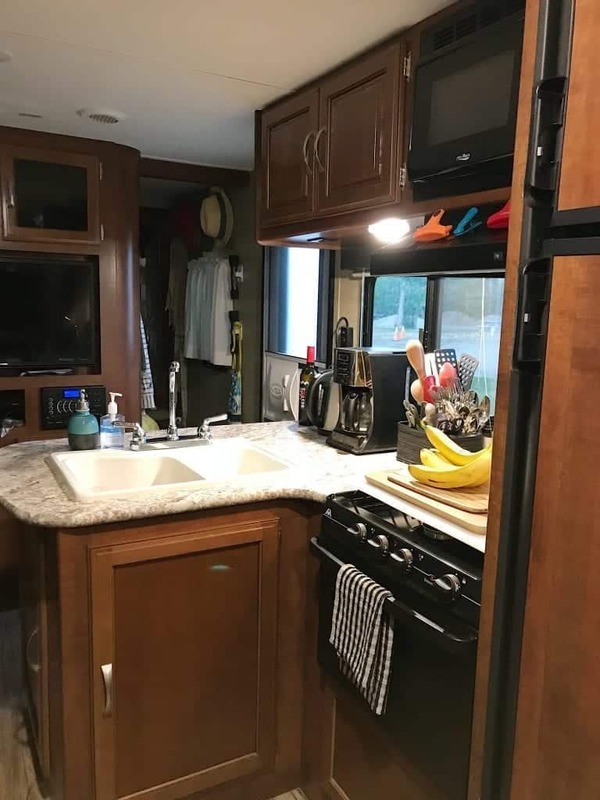 When we first moved into our RV to hit the road full-time I remember stressing over which RV kitchen accessories were the best and most important. I read articles, discussions in Facebook groups and watched YouTube videos. But you know what I found out? I found out that figuring out the best RV kitchen supplies depended on one thing: me. What and how I cook for my family may be completely different than how you cook and what you make for your family. I cook mostly vegetarian. You might be a meat-every-night kind of person. Or maybe a fruitarian. Seriously, there are people out there that only eat fruit! Amazing. It also depends on what your RV kitchen has as far as appliances and storage space go. While I have an oven, microwave, three burner stove and like one cabinet (okay, that’s an exaggeration…I have like two), you might have a convection oven and a little more space. Side note: I have another post on my top 7 kitchen essentials + tips that have helped make meal prep less stressful. 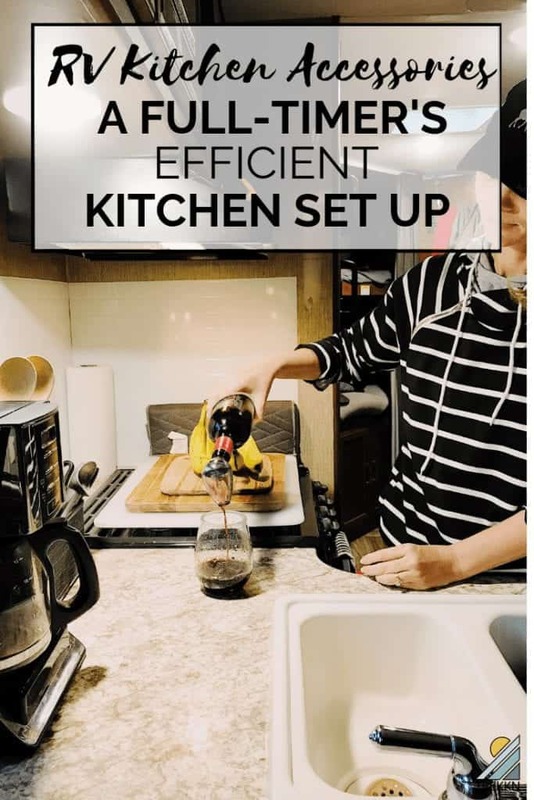 But I wanted to do an extensive list of what I brought with me from our house kitchen to our RV kitchen, as well as any additional items I purchased, in hopes that it might help you with your decision making process. If you’d like a better look at what the kitchen in our travel trailer looks like, watch our RV tour video below. As you can see, I don’t have many cabinets or extra storage space, so what I could bring/purchase is very limited. I’d like to spend some time looking at more RV storage solutions for my tiny kitchen. I’m confident I could be using some of the space better! Some much-needed RV organization has been on my to-do list since we said goodbye to our house. Alright, let’s get started, shall we? Side note: some of these items listed below I also use for our RV outdoor kitchen, which I have come to LOVE having. Ours is outfitted with a two-burner stove and a sink. I’ll do a separate post on all the benefits of having an outdoor kitchen and what we use it for. Please also note: You may have different RV appliances than we did in our travel trailer. For example, a convection oven. Something I’ll admit would be amazing to have! Oh, how I love cooking in a cast iron skillet. I’ve whipped up many fajitas in ours and use it indoors and over a campfire. Mine is pretty heavy, so I had to factor that in as far as weight goes, but I can say I’m very happy I brought it with me. *Great for the outdoor kitchen and campfire cooking. I use a deep skillet like this at least twice a week. 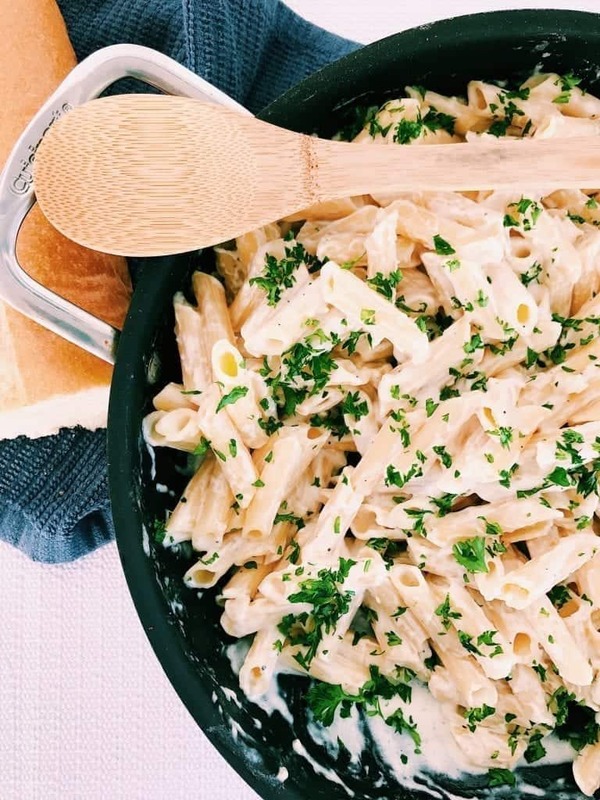 We enjoy a lot of one-pot meals like this Homemade Alfredo Sauce and Penne Pasta and stir-fries, so this skillet has been perfect for those. It goes from stove to oven, which I like for whipping up frittatas. I use one of these for too many things to list! My kids also use it when they want to whip up a quick quesadilla or scrambled eggs. I use the large saucepan for blanching vegetables and simmering pasta sauces. A small saucepan is mainly used for heating up canned beans. I rarely use the small one but keep it on-hand ‘just in case’. I use this for cooking up pasta or soups when I don’t want to use the Instant Pot. When I was in my research phase for cooking meals in an RV, I read in several Facebook groups the importance of a baking stone. Putting a baking stone on the bottom shelf of your RV oven helps spread the heat more evenly. I can vouch that this works! When I don’t use the stone, the bottom of everything burns terribly and the middle and top do not get done. I highly recommend purchasing and using a stone. But don’t forget to measure your oven first before purchasing one. I’m still learning some tricks for baking things in our oven. When we first launched, I didn’t even attempt to use the oven because of the nightmare stories I had heard. I won’t be baking a Christmas turkey anytime soon, but cookies, sheet pan meals, cinnamon rolls, etc turn out really well on a cookie sheet. Just be sure to know the measurements of your oven and cookie sheet. I use our muffin pan all the time for whipping up muffins (obviously). I do breakfast muffins and corn muffins for chili. I also use it for brownies. Say what? Yep, I make brownie muffins for two reasons: they cook quicker than in an 8×8 pan (which uses less propane) and they are the perfect size for ice cream sundaes. Plus, they’re just fun! I’ve since manned up (lol) and have made brownies and pasta bakes that have turned out great. Yep, I’m an Instant Pot lover. 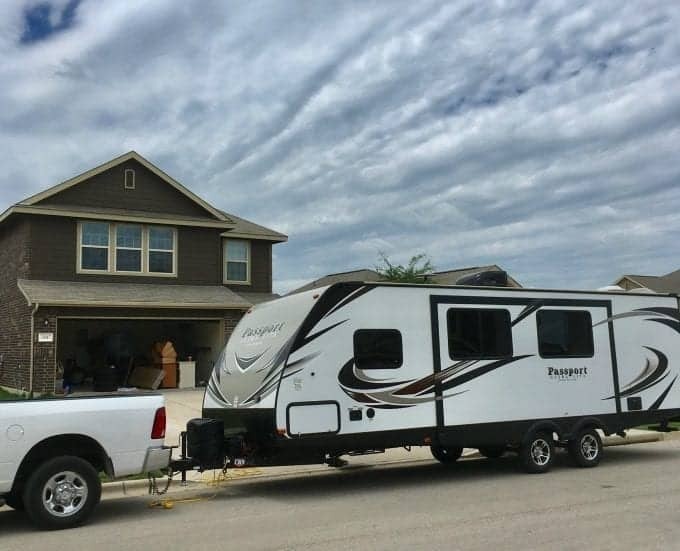 I was before we RV’d full-time, so bringing it with me was a no-brainer. I sold our Crock-pot in a garage sale because for me personally, it just didn’t make sense for RV living. But, I know other RVers love using their Crock-pot, so it just depends on how you like to cook and your lifestyle. It didn’t make sense for me because of time. We tend to work in the mornings and play in the afternoon and evenings. I didn’t want to spend any of my precious work time getting a meal ready for the Crock-pot in the mornings and I also didn’t like the idea of leaving something plugged in while we are away from the RV. RV parks are notorious for losing power for no reason. It’s also super easy to trip a breaker with appliances that pull quite a bit of power. I can just imagine coming home after out and about exploring to find the Crock-pot shut off and our meal isn’t done. With the Instant Pot, I can whip up soups, rice, quinoa tacos, baked potatoes, chili, etc in under 30 minutes. I have the 6 qt. one that doesn’t include the yogurt making option, but I’ve heard from several friends that the 6 qt. option which includes the yogurt maker button is well worth the extra price. It’s really just a personal preference. I went back and forth on trying to decide if I was going to bring my electric griddle with me and let me tell you, I am so glad I did. We use it all the time, especially in the summers when I don’t want to heat up the RV with the stove. Even using the burners (and not the oven) heats things up. It’s also very useful to have when we’re low on propane and I want to save it for heating our home and water. We use the electric griddle for pancakes, grilled cheese, quesadillas, sausage, bacon…and the list goes on. One item I might purchase soon is this Indoor Grill & Electric Griddle Combo. Our friends from The Wanderful Way had us over for brunch one morning during our two-week trip to Canada together. They had one of these and were using it for bacon, but told us all the other things they use it for and how much they like it. 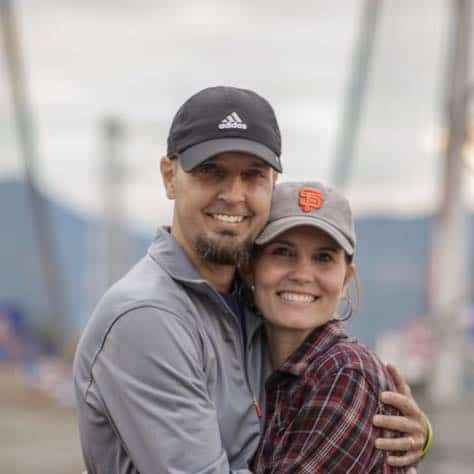 They’ve been full-time RVing for 3 years and are sensational cooks, so they know a thing or two. We have just a basic toaster, nothing fancy, and it’s a well used RV kitchen accessory. From toast to bagels to English muffins…we use it quite a bit. A 12-cup basic coffee maker is just what makes sense for our family of five. We all drink coffee in the mornings and this makes enough coffee for all of us. Plus, my husband programs the coffee maker at night and that’s our alarm clock every morning. I can usually hear the coffee start and then it softly beeps three times when it’s done. And that’s when I get out of bed. We do have a french press and I would like to start using it. Maybe for some late afternoon/early evening decaf? I don’t use this kitchen appliance near enough and I’d like to change that. We all love smoothies, I just got out of the habit of making them since we’ve been on the road. Part of it is because it’s tucked away in a hard to reach space. Part of it is because I haven’t been on top of keeping smoothie making ingredients around. I’m still glad I brought it with us and hope to start using it more for cold soups, smoothies, and shakes. 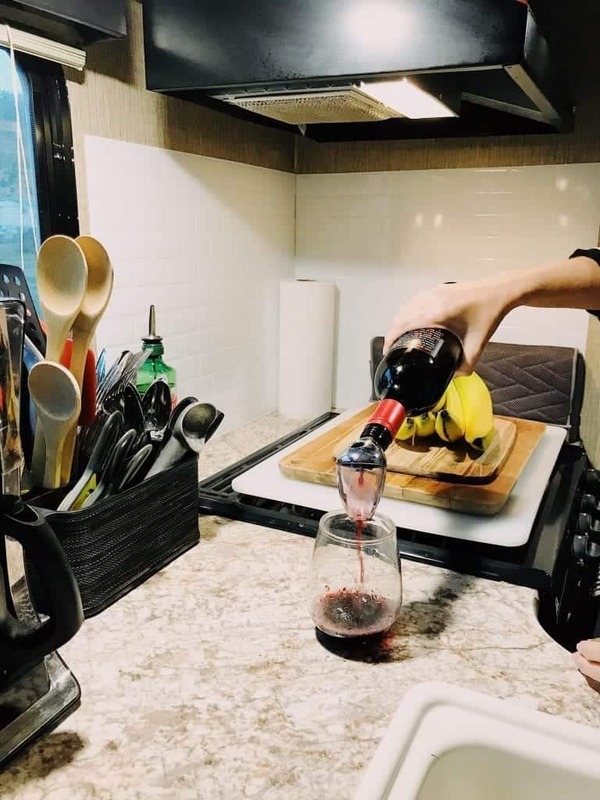 Wine Opener – On a sad note, I used to have an electric wine opener but realized it didn’t make much sense to bring it with me, so I sold it. I miss you. Knife sharpener – I have used this countless times and am so happy I brought it with me. Wooden Cutting Boards – One large and one small. I can place the large cutting board on one side of the sink during meal prep to give me more counter space, which is always needed. Veggetti Spiralizer – We love our zoodles! Side note: I’m not super impressed by the ‘as seen on TV’ one I have, so if you have any recommendations for another one, let me know! Okay, I lied. I added little commentary from me. Apron – My mom bought me an apron from Anthropologie and I had to bring it with me and yes, I actually use it. Just call me the Martha Stewart of RV living. Just kidding, please don’t. Large Cutting Board – I have a large plastic cutting board that fits perfectly over our stove (I measured before buying!) It serves as more counter space and the area I place the dish drying mat on. Dish Drying Mat with Rack – I love this dish drying mat and it’s been one of my best purchases for our kitchen. At first, I bought a collapsible dish drying rack to put over one side of the sink. Long story short, it was annoying and didn’t work for me. This mat goes on the cutting board over the stove when in use and folds up nice and flat when not. Although most RV refrigerators are pretty small, they can still get messy, disorganized and have you asking ‘what the heck is in there?‘ Some of these kitchen accessories for the fridge help with RV organization and some help keep things in place while you’re on the move. Trivets – I use these way more than I thought I would. They’ve been perfect for the occasion I need to place a hot dish on the table or kitchen counter. Phew! I believe that’s it for my RV kitchen accessories. 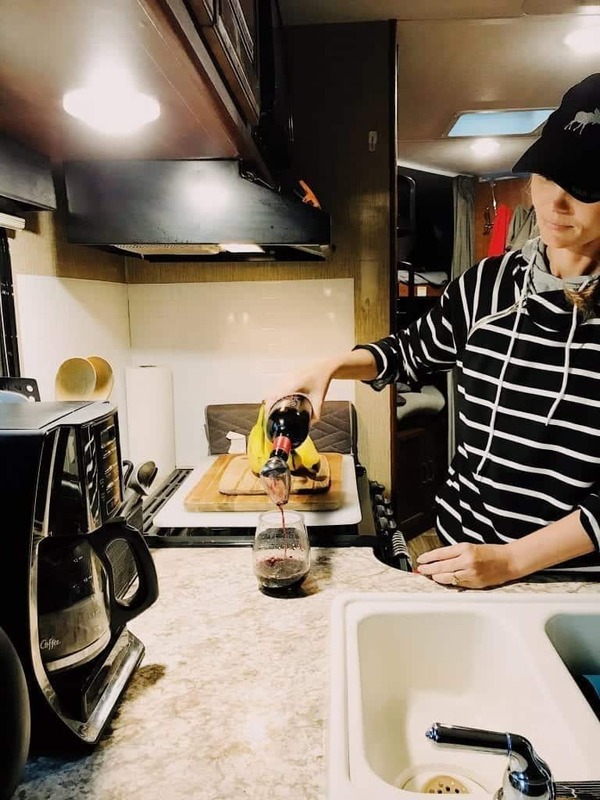 I truly hope this list helps you when you’re trying to decide what to bring to set up an RV kitchen that works for you. Stick blender with whip, chopper, and spiralizer. Little space and works well for soups, smoothies, cakes, etc. Also use a toaster oven for toast(duh) garlic bread, small frozen items. Really great tips Barb! I’ve thought about getting a chopper and a toaster oven. Glad you found this helpful Edith. And thank you for the tips!